Cardiovascular diseases affect the heart or the blood vessels. Because the cardiovascular system provides oxygen and nutrients to cells and removes wastes from them, these diseases have profound impacts on health. Heart dysfunction can range from mild abnormalities to complete failure. The heart beats almost forty million times a year. Variants of the heartbeat can affect health and are called arrhythmias. A persistent resting heart rate above one hundred beats per minute is called tachycardia, and below sixty, bradycardia. If the cause is in the ventricles, the condition is termed ventricular tachycardia or bradycardia. If the cause is in the atria , it is termed supraventricular. A number of factors can cause arrhythmias, including abnormal circulating levels of electrolytes , particularly potassium and calcium, and damage to the heart from insufficient blood flow (ischemia). An electrocardiogram (ECG) may be helpful in determining the cause. An ECG measures the electrical activity of the heart from the skin, even though the heart is deep within the thoracic (chest) cavity. In heart failure, the heart is unable to contract with sufficient force to pump blood to all body parts. Eventually, the lack of adequate blood flow causes death. Heart failure has several causes. Disease of the heart muscle, called cardiomyopathy, is one cause that can be inherited, or have no known origin. More commonly heart failure is associated with insufficient blood flow, which may reflect a blockage in the circulatory pathway. Heart failure is commonly associated with hypertension (high blood pressure), in which the muscular walls of blood vessels contract, impeding blood flow. The heart must work harder to pump the blood and may hypertrophy, or overgrow, to meet the challenge. Eventually, the increased mass requires more oxygen than blood flow to the heart can provide, and the heart muscle begins to fail. An image of a human heart undergoing angiography to repair a massive aneurysm of the aortal arch. occurs in the brain, brain cells are killed and a stroke results. Stroke may also occur when a blood clot blocks blood flow to part of the brain, a condition called an embolism. Embolisms can occur in any blood vessel, but those in the brain can be especially devastating. Decreased blood flow to heart muscle cells can result in a heart attack, or myocardial infarction. This is more likely to occur when heart oxygen demands increase, as during exercise, or if blood vessels to the heart are partially blocked, as in atherosclerosis, in which fatty deposits form on the inner linings of coronary arteries. Initially, decreased blood flow causes angina pectoris, which is a sensation of heavy pressure or squeezing in the chest that may be accompanied by sweating, difficulty breathing, nausea, and vomiting. Complete blockage causes a heart attack, in which heart muscle cells die. It can be fatal. Valves in the heart ensure that pumped blood always leaves through the arteries, and does not reverse direction through the veins. 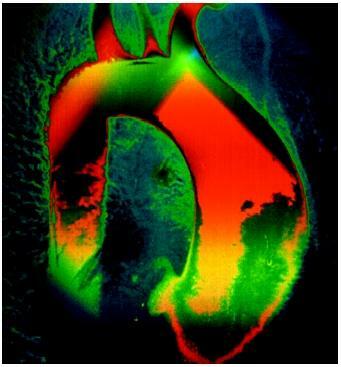 Valve defects can seriously impair the heart's ability to pump blood. Mitral valve prolapse is a common abnormality in which the valve separating the atrium and ventricle bulges back into the atrium when the ventricle contracts. It produces a distinctive type of heart murmur that can be heard through a stethoscope. Symptoms include chest pain, fatigue, and anxiety. Infection by certain species of Streptococcus bacteria can lead to mitral valve damage. The bacteria and the mitral valve have similar surface chemistry. When the immune system attacks the bacteria, it may also attack the valve. The Centers for Disease Control and Prevention, Cardiovascular Disease. <www.cdc.gov/nccdphp/cardiov.htm> . The Mayo Clinic's Heart and Blood Vessel Center. <www.mayo.edu> . McCance, K. L., and S. E. Huether. Pathophysiology: The Biologic Basis for Disease in Adults and Children, 3rd ed. St. Louis: Mosby, 1998. Sandeep, Jauhar. "Saving the Heart Can Sometimes Mean Losing the Memory." New York Times (19 September 2000): F1.